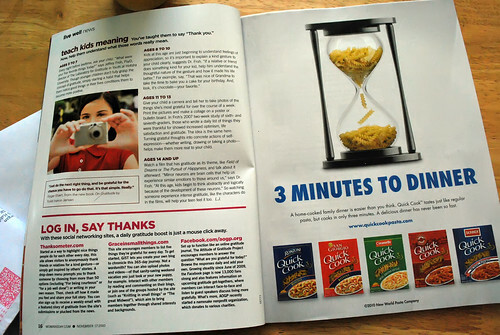 See how, when you open it, it tries to sell you some noodles that are fast to cook even though pretty much all noodles are fast to cook anyway just so they can sell you less noodles for more money with a packet of colourful salt? Don't look there. There is a more important part to the left. Drag your eyes left. Left. Down. Down. Not that far left. Down. 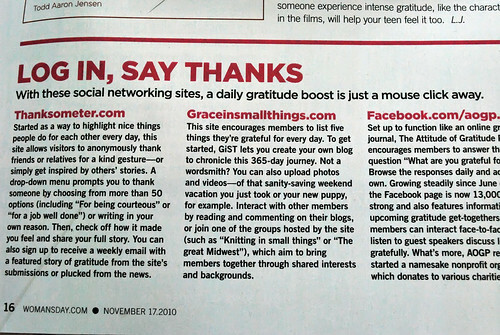 The Grace in Small Things social network that I started two years ago in November 2008 has been mentioned in the print version of Woman's Day magazine! News of it hit while the Palinode and I were in Toronto speaking at BlissDom Canada, and do you think I could find a copy? No, I could not. 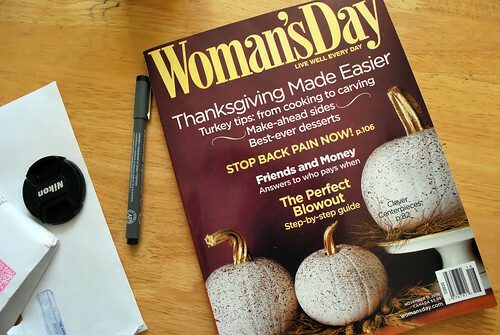 I checked every magazine stand I came across from Toronto all the way down to Niagara Falls, and not a single Woman's Day presented itself to me. So, I just kept telling every person I ran into Grace! In Small Things! is in Woman's Day magazine! and No! I can't show it to you! until yesterday when I finally found a copy, dug through the rack to find the most pristine version of it, and then hugged it to my chest all the way home. GiST is feeling very famous right now. But also very grateful, because she's nothing if not grateful. But still, FAMOUS! How does a social network based on gratefulness show its diva-ness, anyway? She thinks installing an mp3 of Queen's "We Are the Champions" that plays automatically upon entering Grace in Small Things might be just the ticket. Just kidding. GiST would never abuse aesthetics like that. If you'd like to join us in our battle against bitterness during this timely Thanksgiving season, come on over to Grace in Small Things. The water's warm, and we'd love to have you. The 2010 Canadian Weblog Awards: Let the Judging Begin!